As I write, the seventh and final Harry Potter book, Harry Potter and the Deathly Hallows, has just gone on sale. Here in New Zealand, readers are queuing in the mid-winter, mid-morning rain, while in Potter’s birthplace the young and often not so are lining for their copies at midnight. No matter where it is bought, or read, I suspect all will be up the following night reading—if the non-stop, reading-marathon intentions of one fourteen year old acquaintance are anything to go by. I will be buying my own copy shortly, avoiding queues but paying a few dollars more at a reputable small bookstore rather than loss-leading chain, because I am difficult that way. I can afford to be so precious. A friend who can likewise afford to buy The Deathly Hallows at whatever cost is not going to—he just called to request first place in a fast-forming queue for my own. While J.K. Rowling—or publisher Bloomsbury as well for that matter—definitely do not need his money, neither in truth does he—and in a fit of self-righteous indignation at his Scrooge-like spirit, on a day that for many is akin to Christmas, I will be lending The Deathly Hallows first to another, a friend and family who can only afford one copy. Although 47 years old, I suspect my friend will be reading book borrowed before two desperate daughters. I came to Potter later than most—the week before book four, The Goblet of Fire was first released. Harry had somehow passed me by—on a broomstick perhaps—and an argument could be made that this self-created, purveyor of “high art” resented jumping on a bandwagon not his own. Whatever the reasoning I soon made up for lost time, lost an entire week to Potter-mania in fact. Book one, Harry Potter and the Philosopher’s Stone was bought on a Monday; a day and sleepless night later I was back for the second and third instalments; by the end of the week—sleep deprived but thoroughly entertained—purchased the fourth on first day of release, devoured it in a single sitting on barely noticed intercontinental plane ride. As much for my own benefit as for anyone else, and by way of jogging out of shape, at times “potty” memory, here is a quick recap of the books to date, my read-just-a-single-time fleeting impressions, and several predictions for the final book soon to be acquired. Book five: The Order of the Phoenix. Aside from the brooding, introspective first two hundred pages, this is my favourite book of all—albeit followed closely by The Prisoner of Azkaban, The Chamber of Secrets and The Philospher’s Stone in that order. 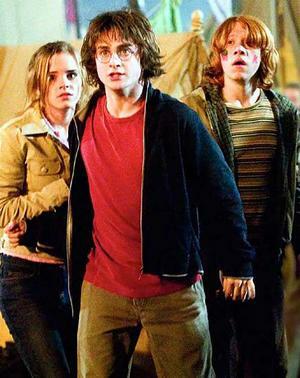 My least favourite was the most recent: The Half-Blood Prince; which to this occasional literary critic appeared narrative and enjoyment constrained—too transparent, perhaps necessary plot machinations to set up a series finale; major plot workings clunking away at the expense of telling a story. Like millions of distraught readers, I resented the beloved Dumbledore dying in this book—admittedly a twist I didn’t see coming—but will claim some after-the-fact prescience on the “Is Snape evil or really evil?” revelation—Rowling had been signaling this change of allegiance since the beginning of book one, Harry Potter and the Sorcerer’s Stone. 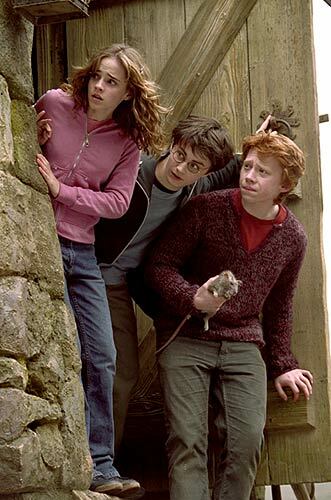 It’s a toss up between Ron and Hermione—the latter is always the most interesting, not to mention most intelligent; the former—along with assorted siblings always the funniest. It is in many ways a shame neither were raised with a fortunate lightening shaped scar. Harry. Really—if Harry is still brooding and being a boring teenager in The Deathly Hallows I may just start skipping pages. Get over yourself Harry—grow a backbone along with a few more inches, or I’ll soon be cheering for (heaven forbid) Draco Malfoy. Funnily enough, and I know I’m quite the snob, mine is the firm opinion that Harry’s screen alter ego, Daniel Radcliffe, can’t act his way out of a paper bag. Rowling has revealed two major characters will die in The Deathly Hallows. I doubt one will be Harry—even though it would be the most shocking ending in all of literature since novelist Yukio Mishima fell upon his own samurai sword. Harry dying would also for the majority of readers be more than unsatisfying, and I do not get the feeling J.K.Rowling, unlike Mishima, is a literary sadist—or intent on ruining the childhood of millions. Snape is a definite option for death however—and you just know he has it coming. Likewise He Who Can’t Be Named—how can the series possibly end without a kill or be killed, good versus evil, mother of all showdowns? At longer odds for untimely character assassination are Ron or Hermione—major, beloved characters, but each in the end narratively dispensable. Predications now aside, I beg to be excused. I have a book to go and buy. Actually I’d have to agree with you. The character of Harry is getting more and more annoying in every books. He’s become really angsty… so different from the Harry in the first book. Then again, I do keep in mind that he ought to be just another teenager trying to grow up 😉 Haha! Thanks Princess. So true. I should also keep in mind that I would hate to read about my own self growing up—even though I do keep writing about it: Miracles out of Mountains out of Molehills.